In 2001, Clickback created a simple email sending app to help our web development clients generate leads. Since then a lot has changed, but thankfully one thing has not. Clickback fanatical obsession with helping B2B companies ignite their lead growth. Today helping thousands of marketers and C-Level professionals solve their company’s lead growth problem with cloud-based B2B lead generation software products, uniquely designed to turbo-charge lead growth. 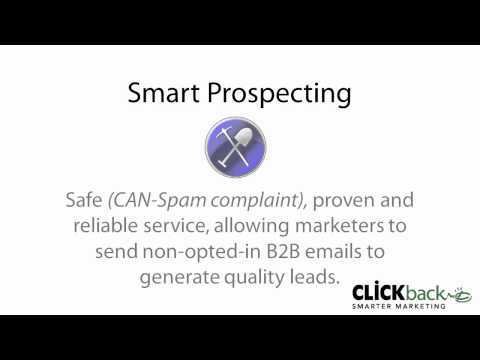 Email lead generation software for effective cold campaigns. Q. How does Clickback ensure the safety and reputation of their customers’ domains and IP addresses? We use our own internal IPs and domains, which means we assume all of the risk. This ensures that you never have to worry about getting your domain or IP blacklisted. In addition, we have sophisticated technology in place within the editor of our email lead generation software to ensure corporate domains are not exposed. Q. Does Clickback MAIL software work with B2C customers? Q. Why do I need an alternative domain as a reply address? Any time you send bulk messages, there’s always a small risk that your domain may be reported as spam. The reply address is the only element that Clickback cannot protect for you. Using an alternative domain adds an extra level of protection. Q. What deliverability rate can I expect with Clickback MAIL software? Unfortunately, there are too many variables involved in email deliverability for us to accurately predict your expected deliverability rate. What it really comes down to is the size – and quality – of your email list. Email subject lines and body content also play a huge role in the deliverability of an email lead generation campaign. What we can say, however, is that customers who use our email lead generation software achieve an average deliverability rate of 70 to 80 percent. Q. How often should I be sending to my purchased list and do you have a creative team that can create emails for my customers? There is no one-size-fits-all number on how often you should send to your purchased email list. It varies. For us, sending an email to our cold email list once per month is enough. But we recommend that you run your own tests with our Clickback MAIL software to determine the email-sending frequency that works best for your business. No, we do not. However, we do have experts on hand who can provide the direction and support you need to achieve the desired results from your email lead generation efforts.